Sony BDV-N590 review | What Hi-Fi? All-in-one home cinema systems have always attempted to be masters of myriad trades, but it’s fair to say the latest generation of these machines are more capable than ever. 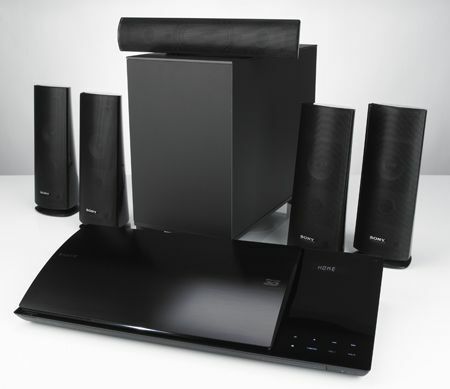 The Sony BDV-N590 is the first 2012 Sony home cinema system to be released, and at its core it’s a 5.1 speaker system complete with 3D Blu-ray player that's capable of bringing surround sound to your TV, PVR or games console. But get it hooked up to the internet and a whole world of extra possibilities emerges, whether it be streaming from your PC or NAS device, watching catch-up TV via BBC iPlayer and 5 On Demand or signing-up to Sony’s Entertainment Network portfolio of subscription content services, Sony Music Unlimited and Sony Video Unlimited. And we haven’t even mentioned the ‘old skool’ connectivity offered by USB inputs and an iPod dock. The flexibility extends to the speakers, Sony’s research suggesting that a) compact satellites are the preferred 5.1 set-up for most people – taller floorstanding speakers will also be available with this head unit, however – and b) the ability to wall-mount the speakers is seen as a real bonus. That’s why the integrated stands on these speakers can be unscrewed, rotated and reattached, ready to go straight in the wall. (See picture right, and watch our unboxing video for a demo of how this works). Should you just want to use them as compact standmount speakers – preferably on stands – then you still need to unscrew the mini stand, thread through the supplied speaker cable and then slide the stand back in to place. It makes the solution neat, but the speaker cable is a little prone to getting in the way of the screw. We have no arguments with the way the system looks. The influence of the Sony PlayStation is obvious and no bad thing – rather some smooth curves than the more familiar Sony BD box design – and extends from the main unit to the tapered speakers. There are touch sensitive controls on the right-hand side of the main unit for basic functions, with a bright display hidden behind it that glows in to life when you turn the unit on. Bright it may be, but the viewing angle and position of the display could be better, and it's not always that easy to read. The Blu-ray player is housed in the bump on the left-hand side of the unit. The disc slot is half away along and loads from the right hand side, which works fine for us but is naturally worth remembering when it comes to installation – you need to be able to get at it from that side rather than the front. This unit’s thorough specification means it will appear throughout the Sony home-cinema-in-a-box range, with greater choice of speakers set to become available. Sony's auto-calibration system now comes with a stereo mic, which once positioned in your listening position runs through the standard series of bleeps in record time to sort out the speaker distances and levels. While distances were spot on, we made some slight manual adjustments to the speaker levels – but the calibration system wasn't far off. The Sony Xross Media Bar has been given a slight rejig here, with the interface divided by types of content – photo, music, radio, video etc. While it's fairly easy to get to grips with and work out where to find what you're looking for, it does mean connected media such as an iPhone shows up in a range of tabs and you have to go to the correct one, say music, to access the specific content. Connect to your home network via wi-fi or a wired connection and you'll find a new look internet portal, too. The Sony Entertainment Network is split in to three sections, with all the familiar on-demand internet content now found in 'apps', such as iPlayer and Lovefilm, and then a video tab for Sony's Video Unlimited servic and music tab for Music Unlimited. It's a thorough offering, especially if you choose to subscribe to the Spotify-style Music Unlimited service or buy or rent SD or HD films from Video Unlimited. There's plenty to get your head round here and along with the simple interface, the remote control is good, too, with a big, clear home button always bringing you back to square one. If you prefer, there's an Android and iOS free remote control app, giving you plenty of control from the palm of your smartphone-toting hand. It's got the styling, ease of use and feature count to belie the affordable price tag – all it needs now is the level of performance to match. And we're in luck. As we run through a few of our favourite test discs, we're seriously impressed by the compact speakers. Not only are they capable of going loud and really filling a room, but they do so without ever sounding harsh or out of control. Detailed and nicely balanced, they deliver a cohesive sound with surround effects moving around you from speaker-to-speaker smoothly, creating an impressive surround whole. Sony knows a thing or two about making an excellent value Blu-ray player and the BDV-N590 is more than up to standard. Watching The Adventures of Tintin: The Secret of the Unicorn colours are bright, pictures are clean and motion is smooth. DVDs are upscaled nicely, too, while even lower quality images from streaming services hold up well enough. BBC iPlayer, especially on the HD channels, looks superb. Connect the system to a 3D TV and the Blu-ray player proves adept at delivering detailed, subtle images with a good sense of depth, too. Naturally your choice of TV is crucial, but it’s clearly a capable Blu-ray player in 3D as well as 2D mode. Of course, all of our high praise is qualified by the fact you can only expect so much from such a feature-packed yet affordable system. Listening to music, whether on disc or through the iPod dock, is a case in point. There’s very little to find flaw with and we sit happily tapping our feet as we work through a few tracks. Yes, the sub could be tighter and deeper, it could sound a bit bigger and more dynamic, but we’re sitting happily listening to a £400 system pumping out music and that can’t be bad. Having recently taken a good look at the latest selection of home cinema all-in-one systems from the big players such as LG, Philips and Samsung, this Sony system scores an instant hit as an ultra-competitive product. It's nicely built, well kitted out, brings access to a whole world of internet content and isn't exactly shabby in the sound and vision departments either. It's got five stars written all over it.